Usually prone to a lot of rain, the northern tip of Vancouver Island has the occasional snow storm during the winter months, leaving the landscape looking more like a winter wonderland. 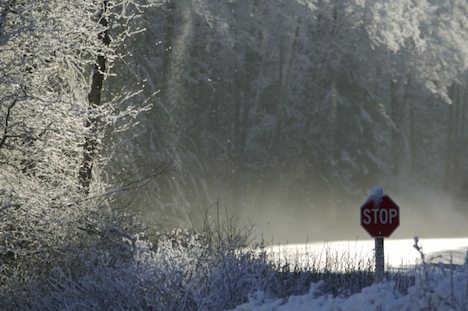 Ice crystals fly through the air and drop from the tree tops along the main road, Highway 19 while snow encases road signs, and low lying shrubs. Highway 19 after a snow storm during the winter, Northern Vancouver Island, British Columbia, Canada. Picture of ice crystals and snow after a winter storm on the North end of Vancouver Island.